Welcome back to our blog about all things wedding! We’re thrilled to share with you today a guide to understanding all of the different wedding dress styles. Blue Bridal Boutique has all these styles and more in our Denver store, but we know it can be hard to know what exactly a princess, mermaid, trumpet, or A-line wedding dress is exactly. 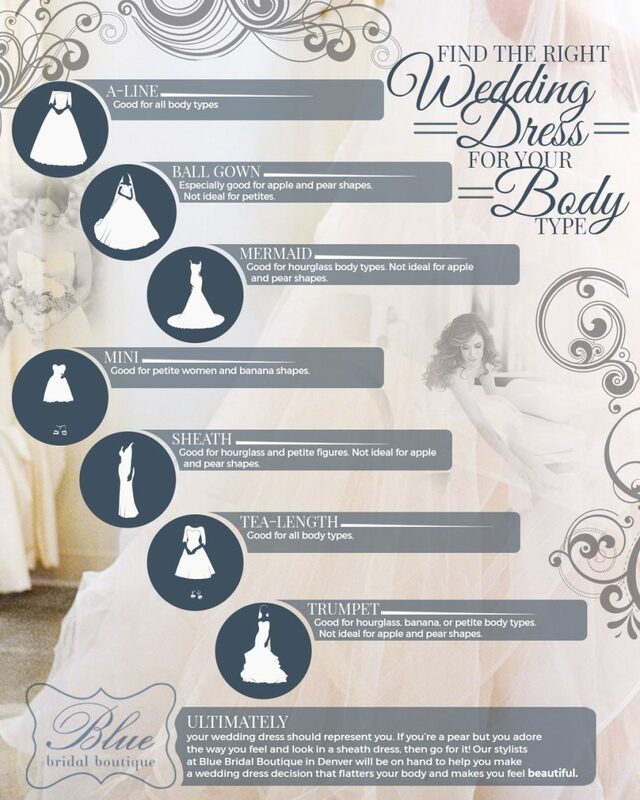 We hope you’ll use this guide to research what style you might like for your wedding dress. We’ll also briefly discuss what body types these dresses are flattering on. Once you’ve learned some of the terminologies, make an appointment with us so you can see how each type looks on your body! A-line dresses get their name because the skirt essentially creates the shape of the letter “A.” The bodice of this dress is fitted through the waist and then flares out towards the bottom. It’s one of our most popular styles because it’s flattering on most figures. Who doesn’t look at a classic ball gown dress and immediately see all of their childhood princess dreams come true? This fairy tale dress has a fitted bodice and flares out at the waist to a full skirt. This dress is most popular for pear and apple shapes because it gives more coverage to the lower body. It’s not great for petite frames because the full skirt can be overwhelming on smaller frames. Mermaid wedding dresses are known for showing off curves, so this could be ideal for the curvy bride, no matter her height. This dress is fitted on the body from chest to knee and then flares out. It’s ideal for slender frames and hourglass body types, and it isn’t as flattering on those who don’t want to accent their curves! If you’re wanting to show a little leg on your big day, then this is the dress for you! This is for women who want a fun party dress that shows a lot of personality. The skirt falls above the knee and is ideal for women with any shape. This dress has a narrow shape that falls beautifully away from your body. It’s excellent for women who want to show off their curves, but it doesn’t have to hug the body. It’s also ideal for women with lean frames, but pear shapes tend to avoid this style. 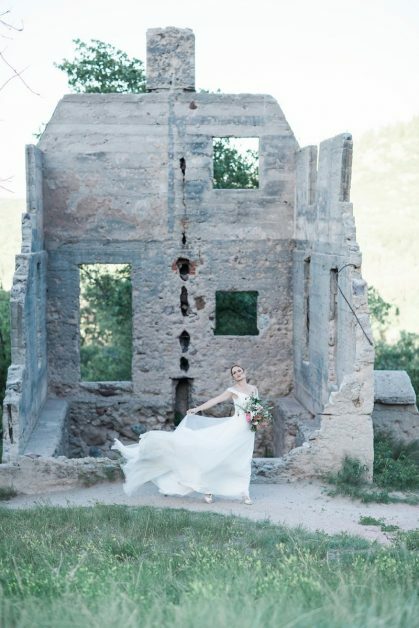 Explore photos of our brides and see if you can spot this style! The skirt on this dress will fall somewhere between the ankle and the knee, and it can be as loose, fitted, or flared as you’d like. It’s ideal for all body types, but is a more nontraditional wedding dress. If you’re looking for a fun, retro feel, then this could be the dress style for you. It’s often hard to tell the difference between the mermaid and the trumpet. This dress, similarly, is fitted through the body, but then flares at mid-thigh instead of at the knee. If you have a small waist — perhaps you’re an hourglass or more petite — this style is excellent. It’s not as flattering on pears and apples because it accentuates the stomach and hips more than other areas of the body. Ultimately, however, your wedding dress should represent you. If you’re a pear but you adore the way you feel and look in a sheath dress, then go for it! Our stylists will be on hand to help you make a decision that flatters your body and makes you feel beautiful. If there’s a designer that you just pine over and would love to wear on your big day, you can also choose a dress from them specifically. Schedule an appointment with Blue Bridal Boutique today so you can say yes to the dress!